At the tourist information you can buy books, postcards, souvenirs, information on events and museums. Even here, you receive free maps. These are usually quite sufficient to navigate in Barcelona. At the tourist information you can also pick up the booked Barcelona Card and the ticket for the tourist bus. The Tourist Information is located on the Plaça Catalunya 17 in the basement (compared with the grey El Cortes Inglés building). Accessibity for wheelchairs with a lift into the basement. In the arrival halls of Terminals T1 and T2B you'll findt he tourist information. In Terminal T2B the information centre is in a booth directly in the arrival hall, in Terminal T1 you'll find it next to the chapel. Just follow the signs to the bus stations. This tourist information is bit inconspicous and it can be easily overlooked. It is opposite the McDonalds. This information is located at City Hall. 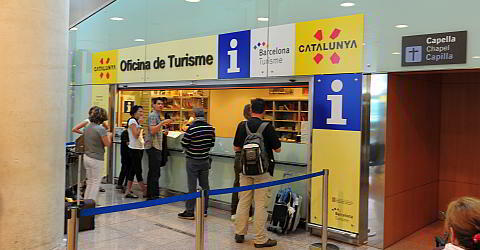 This tourist inormation is in a booth at the arrival terminals of the bus from Girona airport. In the basement is a tourist information with a souvenir shop. You can visit the monument and have a wine tasting. Here you'll get the tickets for the monument. In front of the Monument a Colom to harboeur side. All tourist information centres are closed on on 25 December and on 1 January. Several tourist information centres are located in the city centre (in boothes) e.g. at the Columbus-Monument. In those boothes the Barcelona Card will not be issued and they have no shop.